The traditional stone or brick oven is called a horno - hence the name of Sauza's Hornitos. Traditional distillers (tequilleros) let the piñas soften in the steam ovens or for 50-72 hours at moderate heat. This bakes the agave to process its natural juices (baking, or roasting is tatemar) at around 140-185 degrees F (60-85C - others may be lower: 135-145F; 57-62C). This slow-bake process softens the fibres and helps keep the agave from caramelizing, which can add darker and bitter flavours to the juice and reduces the agave sugars. Baking in sealed ovens also helps retain more of the natural agave flavours. After agave wort (mosto) has finished fermentation, it is ready to distill. At this point, the wort is between 4 and 7% alcohol. This is usually filtered into smaller tanks to remove any excess solids and remaining fibres, and to start distillation. Distillation is an ancient process that dates back to the first century CE. However, the development of the still is usually credited to the Persian alchemist, Jabir Ibn Hayyan, in the eighth or ninth century CE. There are Arabic descriptions of distilled alcohol used for medicine and as a beverage from the ninth century CE. The still appeared in Europe to make alcohol in the 12th century, and spread rapidly in the 14th century when alcohol was prescribed as a medicine for the Black death. Around 1400 it was discovered how to distill spirits from wheat, barley, and rye beers. There are two basic types of still: the traditional alembic (or alambique - by far the most common type) also called pot stills, and the modern column (or Coffey) still. Alembic stills were originally imported into Mexico from Spain in the late 16th century. Arabs had brought the technology of distillation to Spain, before being forced out of the county by Queen Isabella and King Ferdinand II during the 'Reconquista.' Before that, mezcal producers used Filipino-style stills made from local resources. 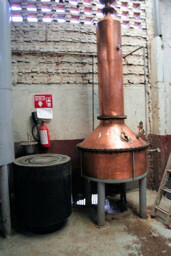 This type of equipment is still in use in small mezcal production. Most alembic stills are made of copper, which slowly sublimates during distillation and over many years will actually wear through the copper. Older stills show their age with patches of newer copper. Newer alembics are made of stainless steel, but may still have a copper component, such as a collector. Tequila makers say the copper imparts a distinctive flavour, which it may do by catalyzing other ingredients (it is present in the finished tequila at a very low 2 ppm). Some producers use stainless steel for first distillation, then copper for the second. The best copper stills are said to come from Tomelloso, in Spain. Corralejo apparently is the only distillery in Mexico to use alambic Charentais stills perfected by the French in the 17th century for the distillation of cognac. Alembic stills range from 100 to 2,000 litre sizes. 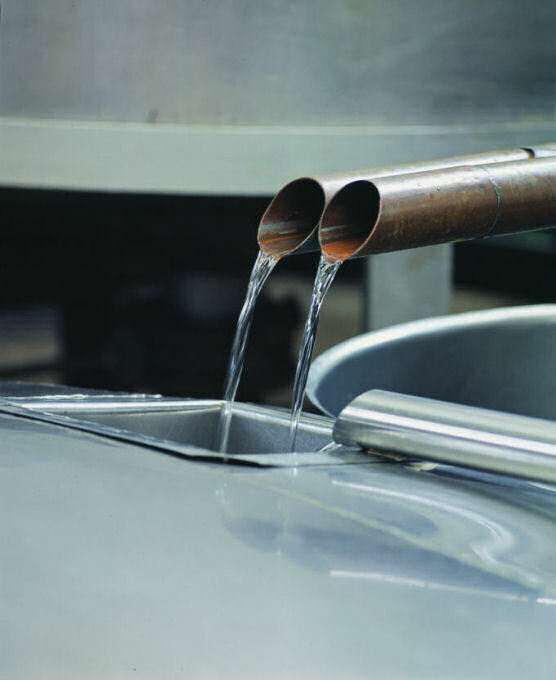 The size of the still also affects the flavour, so many producers use small-to-medium size stills, but larger stills produce tequila faster and in greater volume. Distillation takes four-eight hours. The first distillation takes 1.5-2 hours at around 195-205F (95-96C). It takes the must at 4-5% alcohol and turns it into a product of around 25%, a five-to-one increase. The alcohol boils off leaving most of the water and solids behind. The first product, called the ordinario (or sometimes called tequila primero, this was originally known as vino ordinario), and is about 25% alcohol, although it may be as low as 20%. Alcohol boils at a lower temperature than water - 78.32C (173F) when it's pure. But when in a mixture like a wort, water and ethanol form an azetropic mixture - a constant-boiling mixture. In simple terms this means the alcohol cannot be completely separated from the water. Somewhere around 95% pure, the mere act of boiling won't remove any more water. And when mixed with water, the alcohol's boiling point increases to about 88-90C (190.4 - 194F). To make things more complicated, boiling points drop with altitude. so the temperature of the stills has to be set according to the local elevation. 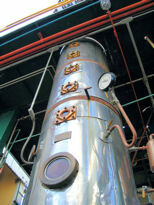 The temperature of the stills will also be set by the producer according to the amount of alcohol in the fermented must. At El Tapatio (La Alteña), some of the fibre from the tahona pit remains in the must during the first fermentation, and must be cleaned out of the still between batches. Carlos Camarena, the owner, believes that leaving the fibre with the juice for as long as possible enhances the final product's flavour and aroma. The second distillation takes 3-4 hours. When completed, the result has about 55% alcohol and is called 'tequila' (originally vino refino, or refined liquor). At Herradura, the first distillation is generated by heating the must to 90C. Their second distillation is done at 95-100C. The heated alcohol is passed through a condenser to cool the vapours. 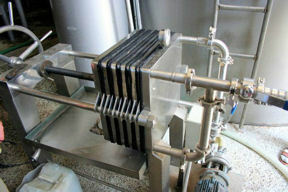 The condenser has coils filled with water which carry away the heat. Sometimes the warm water is used to heat other areas of the plant before it is returned to the condenser. In the 19th century these condensers were sometimes encased in a shell of cement and rock to help draw the heat off. During the distillation process, the first portion of the distillate (the head) to come out of the condenser is drained off. This contains the lighter methyl alcohol - unwanted and toxic, it arrives first because it has a lower boiling point (64.8C or 148.6F). The head also contains other unwanted components like aldehydes, so this portion is discarded. The end portion (the tail, or colos) contains heavier elements and water, so it is also discarded. The desired portion is the middle section, el corazon, the heart, which is the best part and saved for the second distillation. This portion is called the 'ordinario' in the first distillation, and tequila in the second. The heads and tails of the first distillation contain usable alcohol and organoleptic compounds that can contribute to the body and flavour of the tequila, so these are often re-distilled once afterwards to capture any extra tequila and make he result more robust. In some distilleries, they may also be discarded. The results of the second distillation begin at a much higher alcohol content - 75-80%. The initial portion (the head) is discarded as it is in the first, and as the distillation continues, the alcohol content of the tequila slowly drops as more and more of the water and other compounds are boiled off. Towards the end, the alcohol content coming from the still is 15-20%, and in the tequila the percentage has dropped to around 55%. The tequila is removed and the remaining product is the tail - which is discarded. The middle portion of the second distillation is raw tequila. Most producers take the tequila away when it is at about 55-60% alcohol (110-120 proof), and dilute it with de-mineralized water to the desired proof (38-40% or 78-80 proof). Some producers will distill to even higher: up to 75° GL (GL or Gay-Lussac is equal to 1% of alcohol at 68°F/20°C). Manuel Payno's description of 1864 says the tequila was distilled twice, ending up with a product of 46% alcohol. Many distiller will leave it at a higher alcohol level if it is to be aged in barrels, to allow for some evaporation during aging. 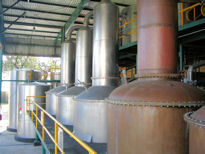 However, at La Alteña (El Tapatio and El Tesoro), distillation continues until the tequila is about 40% alcohol. This means more of the agave-saturated water and more organoleptic compounds are in the tequila. Carlos Camarena does not dilute his raw tequila with water. This gives it more body and a silky texture. La Alteña is the only distillery to use this practice. Since barrels lose alcohol during aging, however, La Alteña distills some tequila to 100 proof twice a year, to add to the barrels to restore the weaker tequilas to their original proof. All tequila is clear right after distillation. Any colour comes later, from aging in wooden barrels (barricas) or from additives like caramel (in mixto only) or wood essence. Before bottling, most tequila is filtered through activated carbon or cellulose filters. The heads and tails from the second distillation are generally discarded without re-distillation. The residue (or dregs: vinazas) in the stills from the distillation is also discarded. Column stills (or Coffey stills, named after its early-19th century inventor, Aeneas Coffey) stills are more efficient, but are not often seen in the tequila trade. They can do the full distillation in one pass, not requiring a second distillation - it is a continuous process. The only column still I have seen is at Tequileña, the producers of Asombroso Tequila. However, because the CRT requires all producers to distill twice, those producers with column stills continue to use an alembic still for first distillation because they have no other way to prove a second distillation was done in the column still. All tequila must be double-distilled by law, but some companies have gone even further to triple-distillation for some of their brands - such as Cofradia's Casa Noble Crystal. Triple distillation seems to have started with Porfidio, but has not caught on as a trend with many distillers. Some tequila aficionados say triple distillation reduces the agave flavour too much, but it isn't evident with the Casa Noble. Additionally, Corzo Añejo’s aging process is longer than that of some super-premium competitors. The spirit is distilled twice, put into small white oak barrels for two to four months and then taken out and distilled a third time. Finally, the Tequila is put back into white oak barrels and aged again, this time for more than a year. However, Bob Denton, tequila expert, seriously challenges claims of triple distillation, and writes, "You cannot go to a any distillery and watch a third distillation being done. Not a single one. Nobody using pot stills does a triple distillation. However, many distilleries who make tequila for export ("private" label) will put nearly anything you want on the label and the CRT doesn't care one iota. The part nobody seems to grasp is that a third distillation is enough to take most, if not all, of the agave flavor out of it. What makes a vodka easy to drink? No flavor. How is that done? Extra distillation." Mezcal was traditionally single-distilled, since the introduction of the NORMA for mezcal, all commercial mezcals are double-distilled as well, and a very few are offering triple distillation. Backyard producers may only distill once. The economics of tequila are interesting. Guillermo Sauza, of Los Abuelos, has said of 30,000 litres of liquid produced from the ovens, there are only 10,000 left after the first distillation, and 2,500 after the second. So there is less than one tenth the volume at the end. Slow distillation (alquitara) is another traditional, premium process, but not often practiced these days. It means heating the must at slightly lower temperatures. 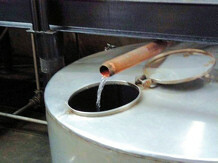 Herradura's distillation is done this way. Laboratories are now required at every distillery, and technicians or scientists check each batch, measuring and recording the scientific fingerprint of each tequila. Sugar and alcohol content are recorded and, along with other chemical data, this information is given to the CRT to assess.